240v added to the boat in the last year. Meeting the owner onboard she is a clean, and tidy sports cruiser that has by appearances been well cared for. Saloon with comfortable seating around the central table, converting to make a large double berth. Shelving and storage. Galley to port with stainless steel sink providing hot and cold pressurised water. Electric single burner hob; Microwave oven; and Fridge. Heads to starboard. AFT Cabin is a double berth. Cockpit with helmsman bolster seat; 'L' shaped seating and aft seating with a Cool Box. Door to transom bathing platform with boarding ladder and fender baskets. Fairly new synthetic decking to the transom and cockpit with a nice set of stainless steel davits. The Mercruiser engines fitted are the LX model increasing horsepower to 135 from 115! 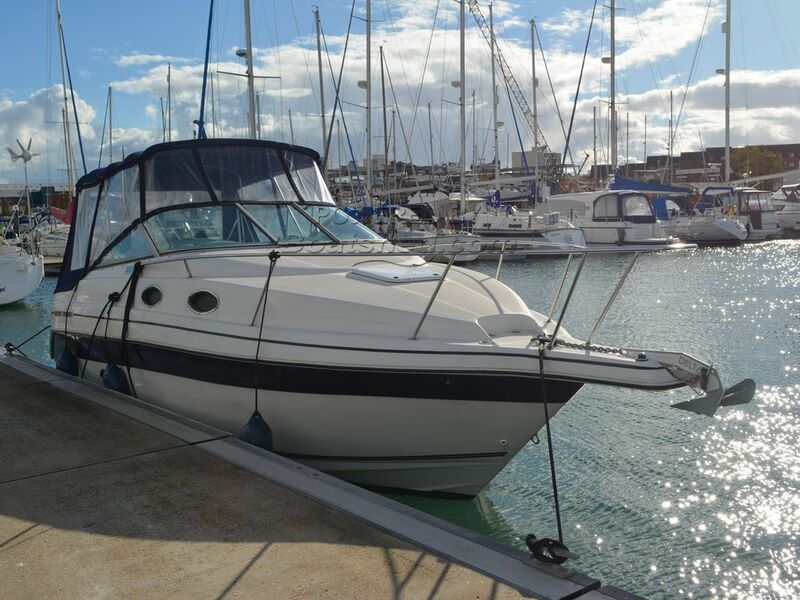 This Regal Commodore 258 has been personally photographed and viewed by Samantha Thirlway of Boatshed Portsmouth. Click here for contact details.